A General Body delegation of Palli Karma-Sahayak Foundation (PKSF) inspected different activities, implemented under its flagship programme ENRICH, in Dhamrai and Manikganj on 17 December 2016. 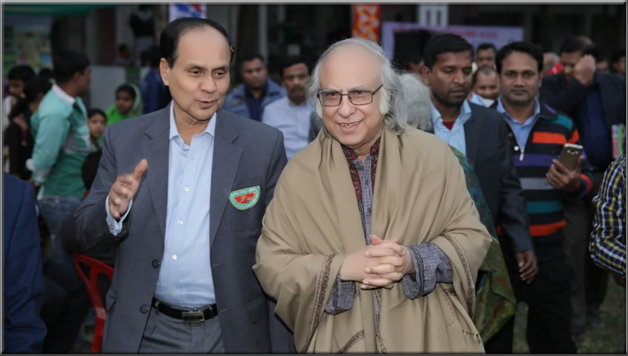 The nine-member delegation led by PKSF Chairman Dr Qazi Kholiquzzaman Ahmad consisted of Prof Zaheda Ahmad of Dhaka University, the Foundation’s General Body members Dr Pratima Paul-Majumder, Mr Khondkar Ibrahim Khaled, Ms Bulbul Mahalanbish, Mr Md Emranul Haque Chowdhury, Mr Nazir Ahmed Khan, Dr Mujib Uddin Ahmad and PKSF Managing Director Mr Md Abdul Karim. 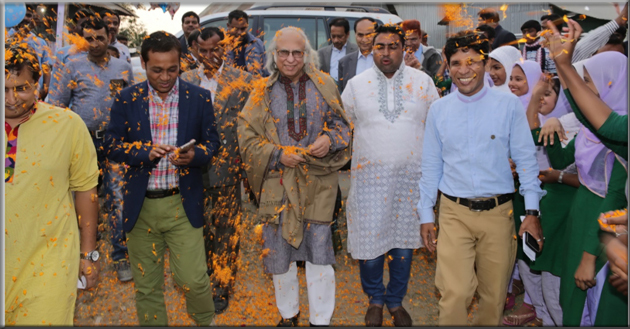 PKSF Deputy Managing Director (Admin) Dr Md Jashim Uddin, who spearheads the ENRICH implementation, accompanied the PKSF top brass during the visit. The General Body provides overall policy directions to the management of PKSF towards designing and carrying out various activities. The daylong visit began with a meeting at the headquarters of SOJAG, a Dhamrai-based Partner Organisation (PO) of PKSF. There, SOJAG Executive Director Mr Abdul Matin apprised the PKSF delegation of the PKSF-supported activities in their working areas. In a presentation, he showed how effectively ENRICH programme was changing the lives of people who earlier had been left out of development activities. The PKSF delegation then visited a number of ENRICH-ed households and other PKSF-supported activities, including health camps, being implemented by SOJAG. “Even a year ago, my grandchildren would not even visit me because I could not provide them with good food to eat or a good bed to sleep in … But now, they would not want to leave once they come here,” says Asiya Begum, pointing towards her 14-year old grandson standing nearby. “My husband is too old to work. So I had to work as a house-help to make a living for us. Now, I myself have to hire people to work for me sometimes,” the woman in her mid-50s told the PKSF delegation. 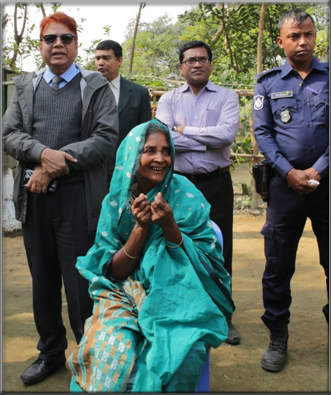 Flanked by a crowd of curious onlookers at the front yard of her house at Uttar Depashai village in Sombhag union of Dhamrai, Asiya was telling how the PKSF’s ENRICH programme had changed her life. “Last year, I took an appropriate loan of Tk 5 lac from SOJAG. With that money, I bought cows, goats, poultry, ducks and pigeons, set up a biogas plant, started vegetable gardening on my homestead. I also was provided necessary training and other services for all those activities,” she said. “So, do you have better life now?” asked PKSF Managing Director Mr Abdul Karim. Asked about her future plans, she said, “First I want to repay the loan, and then leave as much assets as possible for my grandchildren before I die. “My house may be small, but my dreams aren’t,” said Asiya, to cheerful appreciation of everyone around her. 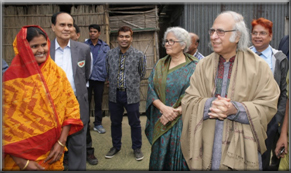 ENRICH, a brainchild of PKSF Chairman Dr Qazi Kholiquzzaman Ahmad, works for sustained poverty eradication and beyond-poverty development for the extreme-poor households in rural Bangladesh. The PKSF delegation then headed for Zamirtta, an ENRICH union in Manikganj district. Wave Foundation, another PO of the PKSF, is implementing the Programme there. They held a meeting with the local stakeholders at a newly established ENRICH Ward Centre in Hatni village under the union. The locals expressed their gratitude to PKSF for selecting the union as a working area of the Programme, and gave accounts of how the ENRICH activities came to them as a bliss. Adjacent to the meeting venue was the house of Hazera Begum who had received ENRICH support for rearing cows, goats, poultry, ducks and pigeons, planting medicinal and spice plants, homestead gardening, producing vermi-compost etc. She walked the PKSF delegation through the activities and told them how the ENRICH support had turned her into a self-reliant woman. A few hundred meters away, Anwara Begum was waiting for the PKSF team with fresh fruits from the garden she had developed with ENRICH support. While the PKSF top officials were enjoying the fruity treat, the woman in her early 30s was telling them the story of her success. “My husband is an expatriate worker. He left the country to earn more so that we can have a better life. But thanks to ENRICH support, I don’t even have to rely on the money he sends. I earn enough to provide for the family,” said Anwara. PKSF top officials re-assured her of continued support so that she could become a replicable model for others. The PKSF delegation was accorded a warm reception as it then went to attend an ENRICH fair at a local school ground. Wave Foundation organised the fair where they displayed different activities of the organisation. The PKSF top officials spoke about the ENRICH mission and vision before a large crowd of the locals and distributed prizes among the winners of different competitions arranged during the fair. This marked the conclusion of the hectic-yet-pleasant daylong visit of the PKSF delegation. The joy of achievement was evident in the faces of the PKSF top officials as they headed back to Dhaka in the evening.